e-post(유럽문화체험) - 스위스 화장실 캠페인 ?! *아시아인과 중국인들을 위한 스위스 화장실 사용법 캠페인 ? 세계1,2위를 다투는 나라 스위스, 우리는 TV나 언론에 나오는 스위스를 보며 동경해 마지 않는다. 실제로 그런 곳이기도 하다. 쵸코렛, 맥가이버 칼, 정확한 기차, 요들, 치즈, 스키 ? 그야 말로 타민족의 취향을 알아보자. *스위스 인들은 규칙을 좋아한다 ? 1. 일요일에는 모두가 쉬는날이다 잔디밭을 깍거나 카펫을 털면 안된다. 2. 발코니에 빨래를 너는것은 전적으로 금지되어있다. 3. 밤 10시 이후에는 화장실 변기의 물을 내릴 수 없다. 따라서 세탁기, 청소기도 사용하지 않는다. 4. 쓰레기 분리수거는 물론 자동차세차도 신경써야한다. 5. 질서의식과 공중도덕을 철저히 지킨다. 때론 이 질서와 규범을 지키는 습관이 때때로 고지식하고 융통성 없어 유머감각이 없고 지나치게 깐깐하다는 평을 듣는다. 항상 남들의 감시를 받고 남들의 판단으로부터 자유롭지 못한 곳이 스위스라고 말한다. 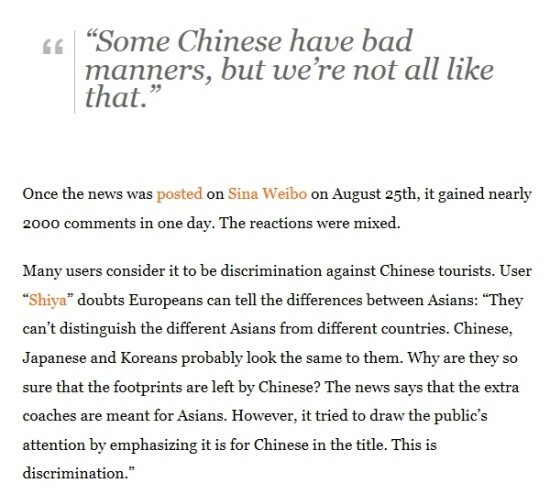 * 스위스 화장실 사용법 ? 하지만 어느곳을 가나 깨끗하게 관리하고 자신이 사용 후 남에게 피해를 주지않기위해 사용 흔적을 남기지 않는 스위스에서 스위스인들이 참지 못하는 더러운 곳이 생겼다면 그 곳은 어디일까? 그곳은 바로 아시아 관광객 특히 중국 관광객들이 많이 몰리는 곳이라고 한다. *스위스 리기 등산열차에서 벌이는 아시아인 중국인? 관광객들을 위한 올바른 화장실 사용방법 캠페인 ! 루체른 리기 등산 열차는 스위스 자연경관과 그들의 역사와 기술력을 함께 경험 할 수있는 좋은기회다. 그런데 리기 열차에서 2015년 여름부터는 아시아인들을 위한 전용열차칸, 그리고 외국인들을 위한 전용칸을 따로 운영헤게되었다. 그 이유는 바로 너무 시끄럽고, 예의없고, 밀치고, 침을 아무 바닥에나 뱉는 아시아 관광객 특히 중국 관광객들을 우해 고민끝에 따로 전용칸을 운영하기로한것이다. Fed up with having to clean up messes in the public toilets, the operators of the Mount Rigi cogwheel railway in central Switzerland have installed pictogram signs showing the right and wrong way to use the facilities as part of an information campaign. 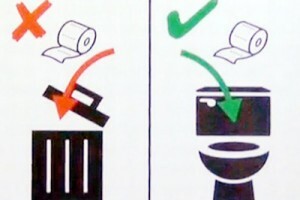 The pictograms instruct users to sit on toilet seats rather than to squat on them and to discard used toilet paper in the lavatory rather than in the waste bin. 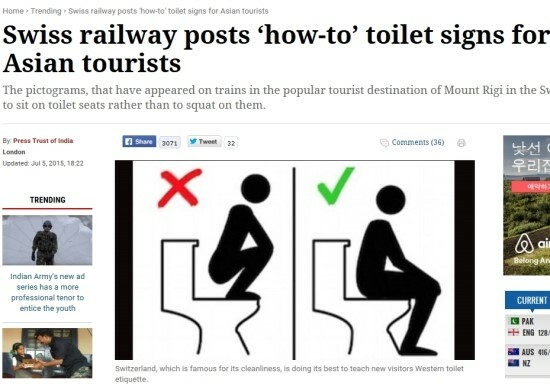 “It happens that guests mount on the toilet seats to do their business — sometimes they don’t know where to put the (toilet) paper,” Roger Joss, director of marketing for the Rigi railway, told 20 Minuten newspaper. The signs, installed in a bid to improve cleanliness, appear to be targeted at tourists from Southeast Asia and the Middle East. “Tourists from the Gulf region or Asian countries are not very aware of our way of living,” Marcel Furer, head of the regional tourist office, told 20 Minuten. “It’s happened that people relieve themselves in the shower rather than in the toilet,” Furer said. 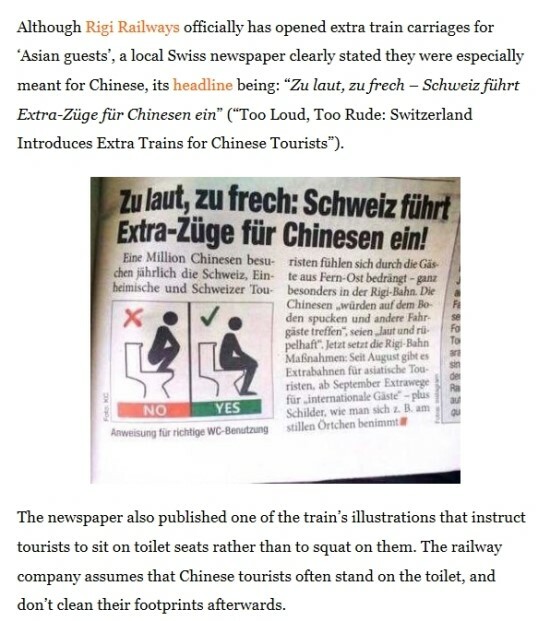 To address the issue, the tourist office has published a brochure explaining Swiss standards for the good use of toilets, as well as other customs, 20 Minuten said. 친절하게 그림으로 설명한 스티커를 이용해 사용방법을 알려주고있다. 많은 중국지역의 화장실이 대부분 조변식이 아니기에 좌변식 습관을 가자지못한 중국인들에게 필요하다고 생각한 아이디어다. For example, the brochure says that it is normal for merchants to give Swiss francs in change for purchases made in euros or dollars. Surrounded by three lakes with panoramic views of the Alps, Mount Rigi is a magnet for tourists and an increasingly popular spot for Asian tourists visiting Switzerland. Around 7,000 visitors take the train to the summit in the summer season. 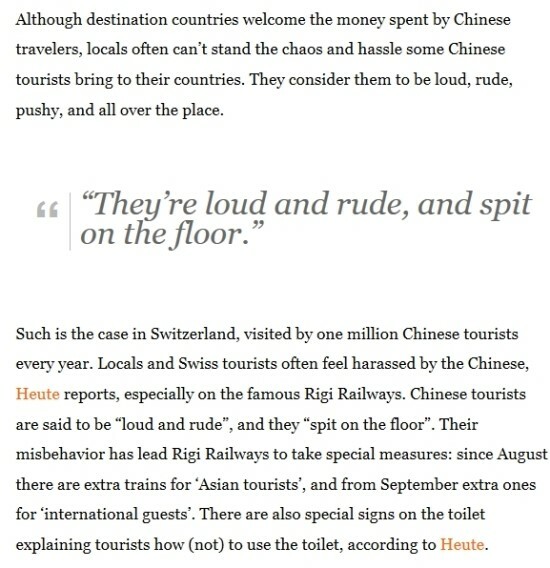 But several of the Chinese and Korean tourists interviewed by 20 Minuten were non-plussed by the toilet-training campaign. Most said they were aware of how to use the toilets and found the signs to be superfluous. 캠페인이 지나친 면이있다고 생각한다고 답했다고 현지언론은 전하고있다. 중국 웨이보에도 리기 등산열차 아시아인전용칸과 화장실 캠페인에 대한 글이 올라왔다. ​"해외 여행은 개인 한사람 한사람 모두가 민간 외교관이라는 말이있다."